 Maine is the last frontier for storied U. S. Route I which knits together the nation’s eastern seaboard, from Key West at the tip of Florida to Fort Kent on the St. John River at the Canadian border. As it cuts its way through the Maine countryside, the highway moves from the Vacationland coast of York County to the endless potato fields of Aroostook. In the process it bisects no less than eighty-three towns containing fully a third of the state’s population. To follow its 527-mile course is to view a rough cross section of Maine life, and this is exactly what writer Lyn Riddle set out to do last July. 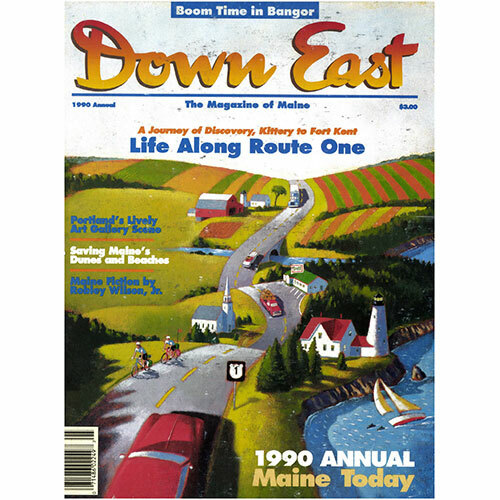 By the time she had completed her journey of discovery (actually several journeys, as she split the trip into small segments), she had poked her head into hundreds of public and private places, interviewed scores of Mainers, and come away with some lasting impressions ofMaine life as it is lived along Route 1. Emblematic of the lively cultural scene that has blossomed in Portland in recent years is the array of fine art galleries that now dot the city, offering everything from Winslow Homer to Robert Mapplethorpe. Photographer Kip Brundage’s portraits of seven gallery owners suggest the range of styles. 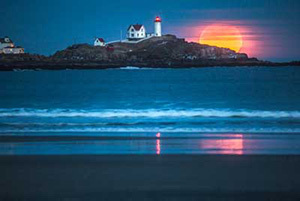 Although little known to the general public, Joseph T. Kelley, at thirty-nine, is the man largely responsible for Maine having the nation’s strongest — and most sensible body of laws to protect its fragile coastline. For his unstinting campaign to enlighten Mainers of all stripes about the threats to the state’s shores, Joe Kelley is the winner of the 1990 Down East Environmental Award. Article by Michael Brosnan. Down East‘s annual look at new Maine fiction comes this year from Robley Wilson, Jr., of Cedar Falls, Iowa. “The older I get,” he says, “the more I feel a need for strong roots, and I’m grateful for mine in Maine.” Born in Brunswick and raised in Sanford, Wilson attended Bowdoin College before and after World War II. He now teaches at Northern Iowa University and is editor of The North American Review, one of the country’s foremost literary reviews. “Sons” is a loosely autobiographical story set in a fictional midcoast Maine town. 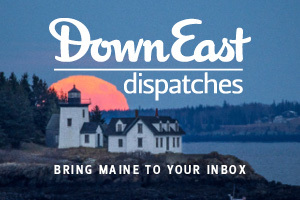 A report by the Editors of Down East on Maine’s friendly environment for small-business development features an illuminating look at today’s Bangor, one of the fastest-growing centers of business in the state. A directory of services for small-businessmen throughout the state is included. I have too weak a character to apologize to the potato growers of Maine for the remarks I made on this page a few months ago about the “couch potato,” a trendy description of those who lie around most of the day watching television. By Caskie Stinnett. Cover: Illustration by Chris Van Dusen.